TOKYO, Jan, 28 2019 - (JCN Newswire) - Fujitsu Limited and PT Fujitsu Indonesia today announced installation of its Fujitsu Public Sector Solution Disaster Information Management System in the Command Center of the North Sumatran Regional Disaster Management Agency. 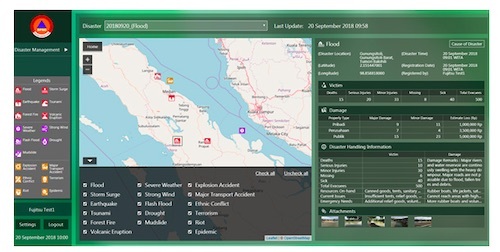 The new system supports rescue and recovery activities as well as quick decision making when disasters occur, delivering centralized management of disaster information. Operations will begin in January 2019. (1) 12 different disaster types 1. Floods; 2. Storm surges; 3. Earthquakes; 4. Tsunamis; 5. Forest fires; 6. Volcanic eruptions; 7. Severe weather; 8. Flash floods; 9. Drought; 10. Mudslides; 11. Explosions; 12. Disease epidemics. 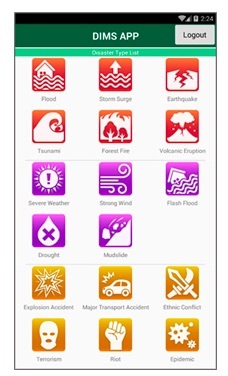 (2) 17 different disaster types 1. Floods; 2. Storm surges; 3. Earthquakes; 4. Tsunamis; 5. Forest fires; 6. Volcanic eruptions; 7. Severe weather; 8. Typhoons; 9. Flash floods; 10. Drought; 11. Mudslides; 12. Explosions; 13. Major traffic accidents; 14. Ethnic conflict; 15. Terrorism; 16. Riots; 17. Disease epidemics.